Our study successfully solve an outstanding problem, how to reduce the dimension of population density equations when realistic synaptic dynamics is incorporated. With the newly proposed Fokker–Planck formalism, population density method (PDM) is conferred short-term plasticity (STP) properties and therefore becomes more widely applicable. As such, our method offers an opportunity to use the PDM to gain new insights into neural mechanisms of brain functions that are strongly dependent on STP synapses. This is the first step toward macroscopic description of large-scale neural network activities, reflected in some commonly used neurophysiological measurements, e.g., EEG, MEG, fMRI, and voltage-sensitive dye imaging data. 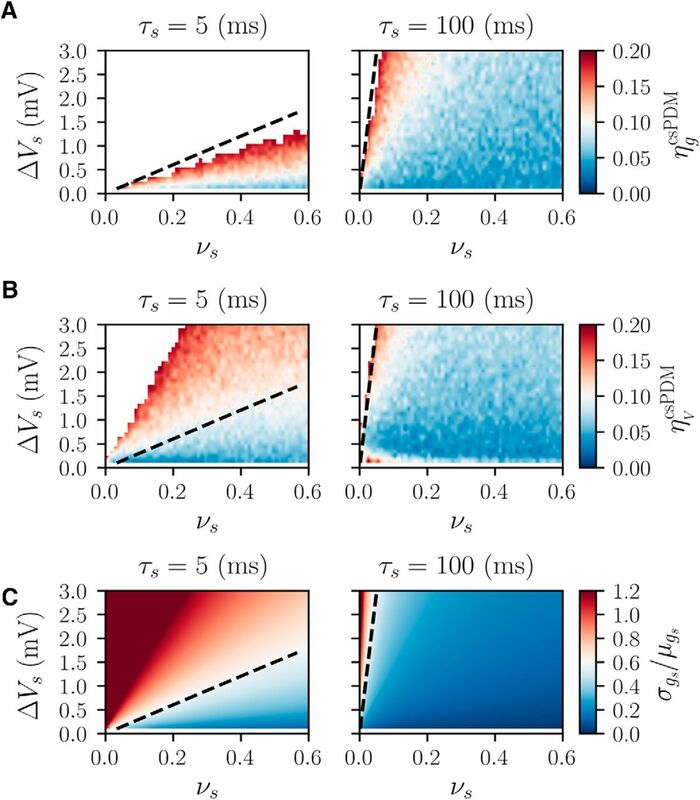 The population density method (PDM) appears as a time-saving alternative to direct numerical simulations [i.e., Monte Carlo simulation (MCS)] of large-scale neural networks of spiking neurons (Knight et al., 1996; Brunel and Sergi, 1998; Brunel, 2000; Nykamp and Tranchina, 2000; Omurtag et al., 2000; Casti et al., 2002; Huertas and Smith, 2006; Augustin et al., 2013). In this method, biophysically similar neurons are grouped into a population, and a probability density function for each population is defined to describe the variability of state variables of such neurons. The evolution of this density function is governed by a master equation (generally a partial differential equation such as a Fokker–Planck equation). A prominent advantage of PDM is that if the master equation can be easily solved in analytical or numerical ways, precise estimates of the quantities of interest can be obtained much faster than MCS. Because of the significant impact of synaptic dynamics on network dynamics, PDMs must ultimately include accurate descriptions of synaptic kinetics to be widely applicable. Unfortunately, incorporating more synaptic dynamics increases the dimension of density functions, leading to a catastrophic decline in computational efficiency because of the increasing difficulty of solving high-dimensional master equations. How to incorporate realistic synaptic dynamics in a computationally efficient manner therefore becomes an outstanding problem in the field of PDMs (Apfaltrer et al., 2006; Tranchina, 2009). Although many previous studies addressed this issue (Haskell et al., 2001; Nykamp and Tranchina, 2001; Apfaltrer et al., 2006; Rangan and Cai, 2006; Ly and Tranchina, 2007; Rangan et al., 2008), they left out some unsolved problems (section 7.10 in Tranchina, 2009). Recently, Ly (2013) developed a principled dimension-reduction method, called modified mean-field method (MMFM), that could deal with those unsolved problems. Nevertheless, we found that the MMFM might not be a robust method and not suitable for nonlinear spiking neuron models. The previous studies concentrated, to the best of our knowledge, only on synaptic dynamics with finite decay and neglected another important synaptic attribute, the short-term plasticity (STP; Markram and Tsodyks, 1996; Markram et al., 1998; Zucker and Regehr, 2002) that also played an important role in certain specific network dynamics, such as reverberatory bursting activity in in vitro and in vivo neuronal networks (Volman et al., 2007; Gritsun et al., 2011), self-organized criticality (Levina et al., 2007), anticipative neural responses (Fung et al., 2012), and sustained population activity related to working memory (Barak and Tsodyks, 2007; Mongillo et al., 2008). Therefore, our goal in the present study is to develop a new solution that allows the PDM to include realistic synaptic dynamics of both finite decay and STP in a computationally efficient manner. In this study, we present a novel and efficient PDM, called colored-synapse PDM (csPDM), to achieve our goal. The strategy behind the csPDM is also to take advantage of dimension-reduction methods, relying on the following scheme: (1) synaptic dynamics are assumed to operate in the diffusive limit so that the dynamic equations of neuronal dynamics are converted into Langevin equations with colored driving noise and all synapse-associated state variables are transformed into input terms (Moreno-Bote and Parga, 2004; Richardson and Gerstner, 2005; Destexhe and Rudolph-Lilith, 2012), and (2) the probability density function method for this dynamic system is then employed (Wang et al., 2013; Barajas-Solano and Tartakovsky, 2016). As such, the synapse-associated state variables are not viewed as the system state variables of the resulting Langevin equations, leading to the reduction of the dimension of density functions. As a consequence, incorporating realistic synaptic dynamics does not decrease the computational efficiency when adopting csPDM, because it does not increase the dimension of master equations. We compare the simulated network activities from the csPDM with those from MCSs, original full-dimensional PDMs (fdPDMs), and MMFMs. 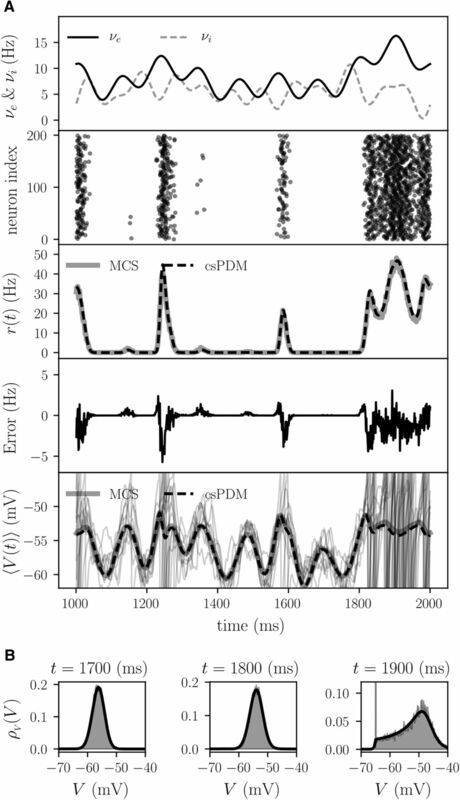 The numerical results show that the results of the csPDM reveal good agreement with those of the MCS and fdPDM in both the steady-state and dynamic regimes. The csPDM provides more accurate simulations than the MMFM and remains more computationally efficient than the fdPDM. 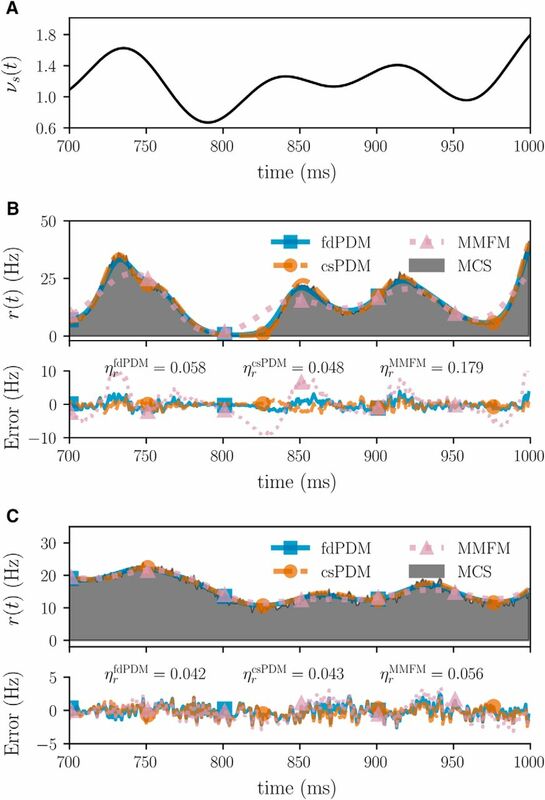 We hope that the csPDM will be valuable to computational neuroscientists who seek accurate and efficient network modeling tools to explore effects of synaptic dynamics with/without STP properties on macroscopic behaviors of neural networks. Here, we describe the equations and parameters used for neuronal, synaptic and network modeling. We present the model (master) equations of the fdPDM, csPDM, and MMFM. The corresponding closed-form solutions for evaluating firing rate responses (network activities) are also described. At the end of this section, we present the numerical method used to solve the model equations of the csPDM as well as the methods used to quantify simulation errors. A summary of the notation for all the main dynamical variables and physiological parameters is given in Table 1. The large-scale network considered here is a neuronal population of N uncoupled exponential integrate-and-fire (EIF) neurons (Fourcaud-Trocmé et al., 2003) receiving only synaptic inputs from the outside. We choose the EIF model mainly because it can offer better prediction of spiking times for a given current input than the leaky integrate-and-fire models and quadratic ones (Fourcaud-Trocmé et al., 2003). In addition, its adaption version, i.e., the adaptive EIF model (Brette and Gerstner, 2005), is capable of reproducing various firing patterns observed in in vivo recordings of cortical cells (Naud et al., 2008; Touboul and Brette, 2008). In fact, the csPDM derived in the present study can be directly applied to simulate neural networks of adaptive EIF neurons. external synaptic connections. The synaptic input on each connection is a set of unitary spiking events whose random arrival times are assumed to be governed by an inhomogeneous Poisson process. νs(t) denotes the mean rate of the Poisson process for the input through the sth-type receptor. to satisfy basic premises of the PDM, two arbitrary synaptic inputs are assumed to be statistically independent if they are mediated by different types of receptors and to be statistically identical if mediated by the same type. ). Afterward, V is immediately reset to a resetting voltage, Vr, and, then, clamped for a refractory period, τref. (2) where gs(t) is the (collective) synaptic conductance for the input mediated by the sth type of receptors, and Es is the corresponding synaptic reversal potential. Equation 2 refers to conductance-based synaptic models. refers to the spike train consisting of synaptic events summed from all synaptic connections through the sth-type receptor. (7) at the level of a single synapse. The jump size of the synaptic conductance caused by a spike now depends on us and xs. us is the running utilization parameter and xs is the running fraction of available neurotransmitters. The dynamic value ranges from Us to 1 for us and from 0 to 1 for xs. Us refers to the base level of us. us = 1 means a presynaptic spike is allowed to use all available neurotransmitters, and xs = 1 means all neurotransmitters are available. and small values of Us; Barak and Tsodyks, 2007). Note that we keep the subscript s in the Equations 5–7 above, because it is likely that the synaptic connections through different types of transmitter receptors have different STP types.
) as a whole. This quantity can be computed by the direct use of the MCS, where states of all neurons and synapses are explicitly traced according to Equations 1–3 or Equations 1–7 if STP properties are involved. For all our simulation examples, MSC is performed with the brian2 simulator (Stimberg et al., 2014). In all simulations, the network composes of N = 10,000 EIF neurons, and cs = 200 for all receptor types. is a small time window. Δ t is always set to 1 ms in our simulation examples. The assumptions and conditions, under which the fdPDM provides an exact description of network activity, have been previously discussed (Nykamp and Tranchina, 2000; Omurtag et al., 2000).
. Equation 9 states that the integration of the density function over Ω is the probability of finding neurons whose states are within that subdomain in a large neuronal population. Note that, here, we do not consider STP properties on synaptic connections to illustrate our main ideas in the present study in a simple way. We will consider these properties only for the csPDM later. where Vlb denotes the lower bound of the membrane voltage. The former boundary condition results from the resetting mechanism of spiking, meaning that the voltage probability flux across Vc, accounting for the generation of action potentials, re-enters the state space on Vr after the refractory period. The latter ones mean no probability fluxes flow outward the domain through other boundaries. As stated, the boundary conditions result in the conservation of the number of neurons. That is to say, the integration of the density function over the domain always equals to one in the absence of refractory period. The computational time required for solving the master equation depends on the number of its dimensions. Generally, solving a high-dimensional master equation is highly time consuming. Previous studies (Apfaltrer et al., 2006; Tranchina, 2009) have suggested that the fdPDM cannot be considered as a time-saving alternative to the MCS if the dimension of the master equation exceeds three. In the following, two other methods used to tackle this issue are described. MMFM is a documented method, and csPDM is a new method proposed in this paper. could be computed before simulations. This section presents the derivation of the csPDM. csPDM is inspired by the probability density method for Langevin equations with colored noise (Wang et al., 2013; Barajas-Solano and Tartakovsky, 2016). So, we start by presenting how to transform the Equation 1 into a stochastic Langevin equation through the diffusion approximation of gs. resulting from synaptic dynamics with finite synaptic time constants (Destexhe and Rudolph-Lilith, 2012). That is why we use “colored-synapse” as the prefix of this method. denotes the average membrane voltage across the population. They are similar to what used in the fdPDM except for the last boundary condition, which means that no neuron locates at Vc because the neurons whose voltages reach Vc are reset to Vr immediately. if STP is included. csPDM is expected to be more computationally efficient than fdPDM because solving one-dimensional quasi-Fokker–Planck equation undoubtedly takes less time than high-dimensional partial differential equations. Basically, they are solved numerically. In the next section, we present the numerical method used for solving the quasi-Fokker–Planck equation. As a consequence, the Equation 26 is transformed to a conservative hyperbolic equation. in which ϕ1 and ϕ2 are shape functions. are defined in the same way. Generally, Equations 10, 16 are also solved numerically. We adopt the so-called discontinuous Galerkin method to solve them. The details of this method are not stated here. Please refer to Huang’s paper (Huang et al., 2015) for details about the numerical method. (50) to check the validity of diffusion approximation on synaptic dynamics. is the average error ratio on the marginal voltage density function.
. It is used for comparing performances of the fdPDM, MMFM, and csPDM. means the average error ratio on the population firing rate obtained from fdPDM, MMFM, or csPDM. is calculated from Equation 8.
is calculated from Equation 13 for fdPDM, Equation 18 for MMFM, and Equation 33 for csPDM.
. Next, we start to show simulation results by first checking the validity condition of diffusion approximation of synaptic dynamics.
. In the following simulations, we choose ΔVs as 1 mV for the excitatory inputs.
. Blank areas in A, B indicate the error ratio of >0.2. by csPDM are similar with those by MCS if the input rate νs is increased. τs is set as 5 ms in all examples. Shaded area: MCS. Black thick line: csPDM. 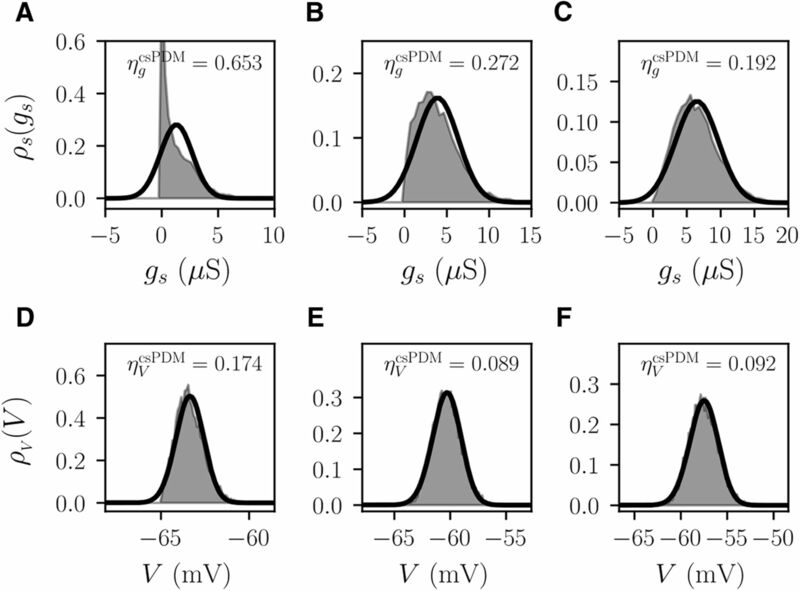 The performances of fdPDM, MMFM, and csPDM are first examined via steady-state analyses of population firing rates in response to fixed excitatory inputs. Here, we also consider two cases, τs = 5 and τs = 100 ms, and set ΔVs = 1 mV and Es = 0 mV. Figure 3 displays input-output curves computed by MSC, fdPDM, csPDM, and MMFM. Results show that csPDM gives an estimation of input-output curves that are close to those from MSC and fdPDM with errors <1 Hz for both τs = 5 and τs = 100 ms. These results indicate that csPDM can accurately estimate steady-state output population firing rates although it just tracks the marginal voltage density function. In contrast, MMFM gives accurate estimations of steady-state output firing rates only under the condition of τe = 100 ms. It overestimates the actual firing rate in the fluctuation-driven regime (i.e., νs < 1) and underestimates the actual firing rate in the mean-driven regime (i.e., νs > 1) in the case of τs = 5 ms (Fig. 3A, bottom panel, pink dashed line with triangle markers). The overestimation or underestimation of the MMFM in the case of τe = 5 ms was also observed by Ly (2013). However, the demonstration that such overestimation or underestimation disappears when the synaptic time constant increases has not been reported. Input-output curve comparison. The top panels in A, B show the input-output curves computed in four ways: MCS (black solid line with diamond markers), fdPDM (blue solid line with square markers), csPDM (orange dashed line with circle markers), and MMFM (pink dashed line with triangle markers). Synaptic time constant (τs) is 5 ms in A and is 100 ms in B.
from MCS. ΔVs = 1 and Es = 0 mV in this example. with an increasing magnitude of 0.3 (from 0.07 to 0.38). So does increasing κ (from 0.1 to 0.4). In other words, MMFM is not a robust method for EIF models. 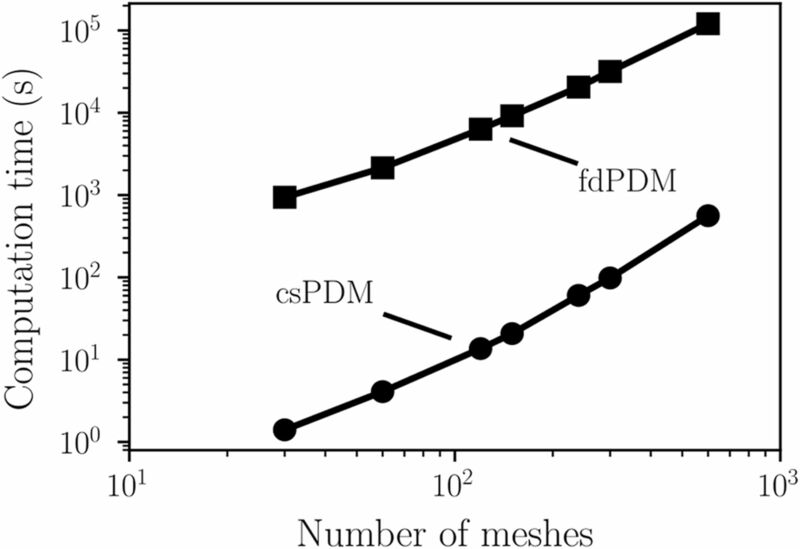 Figure 6 shows the computational time spent by fdPDM and csPDM subject to different numbers of meshes employed in numerical methods for a simulation of 1 s. The numerical simulation used in this test is the same as shown in Figure 4. Remarkably, the computational efficiency of csPDM is ∼1000 times better than fdPDM. Low computational efficiency of fdPDM certainly comes from the existence of the gs-dimension in the master equation because, except for the requirement of more grid meshes along this dimension (We set 120 meshes along this dimension), its existence leads to the necessity of extremely small time steps for satisfying the Courant–Friedrichs–Lewy condition to ensure numerical stability of discontinuous Galerkin methods (Huang et al., 2015). In this case, the time step is 0.02 ms for fdPDM but 0.2 ms for csPDM. were computed over the interval from 600 and 1000 ms.
are 0.058, 0.048, and 0.179 under τs = 5 ms, respectively. They are 0.042, 0.043, and 0.056 for τs = 100 ms. ΔVs = 1 and Es = 0 mV in this example. Average error ratios of fdPDM, csPDM, and MMFM in population responses under different parameter sets. A, Subject to varying ΔVs. B, Subject to varying gl. C, Subject to varying κ. D, Subject to varying Vr. Blue solid line with square markers: fdPDM. Orange dashed line with circle markers: csPDM. Pink dotted line with traiangle markers: MMFM. means average error ratios corresponding to fdPDM, csPDM, and MMFM. Comparison of computational time between fdPDM and csPDM. As shown, the computational speed of csPDM is almost 1000 times faster than fdPDM. In the next two examples, we only use csPDM to estimate the population dynamics and compare the results with those of MCS to evaluate its performance because, via the examples above, it has been demonstrated that, compared to fdPDM and MMFM, only csPDM can provide simulation results efficiently and accurately. To highlight the outstanding ability of csPDM to achieve dimension reduction, here, we consider a real case where a population of cortical pyramidal neurons receives excitatory inputs from the neighboring pyramidal neuronal population mediated by AMPA receptors and, meanwhile, inhibitory inputs from the interneuron population mediated by two types of receptors, GABAA and GABAB (Suffczynski et al., 2004; Cona et al., 2014). To mimic this situation, we consider a single uncoupled population of EIF neurons, representing pyramidal neurons, which receive external excitatory inputs mediated by AMPA-type receptors, which have τs = 5 ms and ΔVs = 1 mV, and inhibitory inputs mediated by GABAA-type receptors, which have τs = 10 ms and ΔVs = 0.25 mV, as well as GABAB-type receptors, which have τs = 100 ms and ΔVs = 0.25 mV. Each neuron is assumed to have 200 excitatory and 200 inhibitory synaptic connections. can be correctly captured by csPDM. at t = 1700 , 1800, and 1900 ms from left to right. Shaded area: MCS. Black thick line: csPDM. between MSC and csPDM. In summary, the population response can inherit the STP property from synapses, and csPDM captures such property qualitatively. 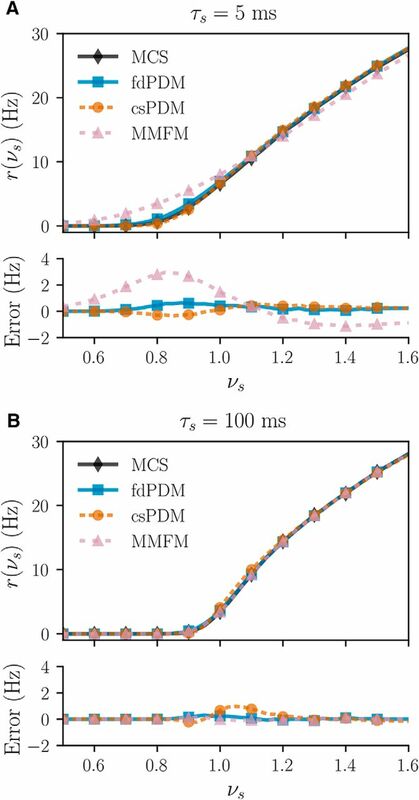 In this study, we present a principled and straightforward dimension-reduction method for PDM to handle realistic synaptic dynamics and compare it with another dimension-reduction method, called MMFM proposed by Ly (2013). We name the newly proposed reduction method csPDM. The csPDM does not assume specific limits on synaptic time constants so that we can consider synaptic dynamics mediated by all kinds of common receptors, including AMPA, GABAA, GABAB, and even NMDA. Through our examples, it is demonstrated that csPDM can accurately capture the firing rate responses in both the steady-state and dynamic regimes over a large range of synaptic time constants from milliseconds to hundreds of milliseconds. As seen in Equation 24, the resulting quasi-Fokker–Planck equation leaves out all synapse-associated dimensions and just tracks the marginal density function of membrane voltages across the population. As a result, csPDM is extremely computationally efficient even when many types of receptors are included in the network model. The computational speed of csPDM is much faster than that of the original fdPDM by an order of three under the case where one type of receptors is incorporated (Fig. 6). If three types of receptors are incorporated, like in the third example in this study, fdPDM can never be considered as a computationally efficient modeling tool to simulate neural networks because of the inherent difficulty of solving a four-dimensional master equation. Actually, previous studies have argued that solving a master equation with more than three dimensions may spend much more time than MCS (Apfaltrer et al., 2006; Ly and Tranchina, 2007). However, csPDM can efficiently and correctly provides simulations of network activities in this case (Fig. 7). On the other hand, increasing the number of receptor types in the network model does not reduce the accuracy of csPDM considerably. is 0.048 when one type of receptors is included (Fig. 4) and is 0.067 when three types are included (Fig. 7). when gl is increased, i.e., reducing the membrane time constant (Fig. 5B). By robustness analysis, we found that the accuracy of MMFM is sensitively influenced by the value of κ (Fig. 5C), which controls the nonlinearity of EIF neuronal dynamics by adjusting the strength of exponential currents (Eq. 1). Increasing κ, i.e., increasing the nonlinearity, decreases the accuracy of MMFM. Actually, MMFM relies on the assumption that the membrane voltage inherits randomness entirely from the stochastic conductance variables, and the conductance variables evolve independently of the membrane voltage (Ly, 2013). However, the author claimed that such an assumption might only be reasonable for linear models such as leaky integrate-and-fire neurons. So, MMFM may not be suitable to simulate network dynamics of nonlinear spiking neurons, like the EIF neurons used in this study. On the contrary, csPDM only assumes that the conductance variables evolve isolatedly, which is true no matter what neuron models are used. Accordingly, it is more general for the type of neuronal models. Furthermore, in the csPDM, the membrane voltage is allowed to be influenced by other random sources, for example, the random release of neurotransmitters (Faisal et al., 2008; Destexhe and Rudolph-Lilith, 2012), which may just add extra noise terms into the stochastic diffusion tensor in the quasi-Fokker–Planck equation without increasing its dimension.csPDM relies on the diffusion approximation of conductance variables. Physiologically, the assumption of diffusion approximation is quite reasonable in that the number of synaptic contacts covering a typical cortical pyramidal cell is indeed very high, in the range of 103–104 (Braitenberg and Schüz, 1991). Each spike at a synaptic contact only alters a post-synaptic potential of <1 mV on average (Markram and Tsodyks, 1996; Markram et al., 1998). So, in our cases, each excitatory or inhibitory spike is designed to cause a maximum change of ≈1 mV in the membrane potential. (τm is the membrane time constant at rest). This fact implies that Equation 24 might be adequate for an even wider range of parameter sets. should include higher-order statistics of both us and xs. However, such an equation is unclosed. Before a closure method is available, the assumption of independence between us and xs is a compromised solution (Tsodyks et al., 1998). Note that it is possible to replace the phenomenological model of STP used here with another elaborating model where state variables are independent with each other. If so, the STP property of population responses can be quantitatively captured by csPDM. This is one of the directions of our future work for improving csPDM. The derivations of csPDM and numerical examples used for testing are based on a single uncoupled population. Of course, what we derived in this study can be extended to the applications of simulating larger neural networks consisting of multiple coupled populations. However, for the correct use of csPDM, synaptic connections must be sparse, because a large number of synaptic connections can result in the violation of basic assumptions of PDM–Poisson and statistically uncorrelated inputs received by each neuron (Brunel, 2000; Nykamp and Tranchina, 2000; Huertas and Smith, 2006; Augustin et al., 2013). These basic premises can be violated when two neurons share many common pre-synaptic neurons, that is, when there are a huge number of connections between presynaptic and postsynaptic populations. We found that the number of synaptic connections depends on the size of ΔVs. If ΔVs is large, the number of connections has to be small because postsynaptic neurons have to receive statistically independent inputs. Postsynaptic neurons are more likely to receive exactly the same inputs if ΔVs is large and the number of synaptic connections is huge. When including many state variables, such as synaptic conductance variables for different types of receptors and synaptic facilitation and depression state variables, the original PDM becomes impractical because of the incredible increase in the computational load. In this study, this critical issue is solved by the probability density function method for Langevin equations with colored driving noise. 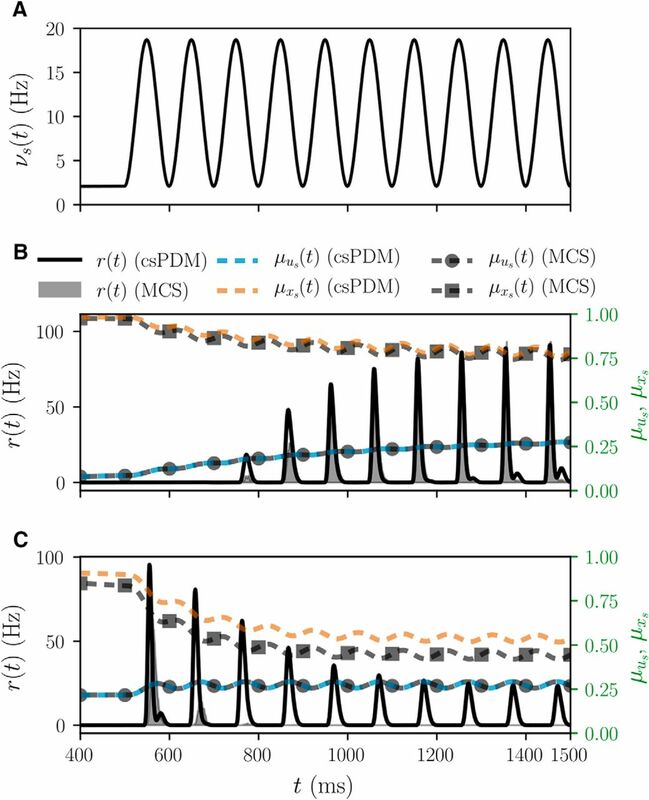 The newly proposed method, termed csPDM, gives quantitatively accurate firing rate responses in both the steady-state and nonequilibrium regimes and highly qualified estimations of time-varying marginal density functions of membrane voltages. Importantly, csPDM is able to qualitatively manifest STP in an easy way almost without increasing computation demands. It appears that csPDM is generally applicable as a time-saving tool for modeling large-scale neural networks. We hope that our work will inspire further progress in the development of PDM and benefit computational and theoretical studies of synaptic dynamics in network dynamics. This work was supported by the National Cheng Kung University Hospital and funded by a grant (MOST 105-2314-B-006-080-MY3) from the Ministry of Science and Technology, Taiwan. Braitenberg V, Schüz A (1991) Anatomy of the cortex: statistics and geometry. New York: Springer. Destexhe A, Rudolph-Lilith M (2012) Neuronal noise. New York: Springer. Dayan P, Abbott LF (2001) Theoretical neuroscience. Cambridge, MA: MIT Press. Knight BW, Manin D, Sirovich L (1996) Dynamical models of interacting neuron populations in visual cortex. Symposium on robotics and cybernetics: Computational engineering in systems applications (Gerf EC, ed). Lille, France: Cite Scientifique. Nykamp DQ, Tranchina D (2000) A population density approach that facilitates large-scale modeling of neural networks: analysis and an application to orientation tuning. J Comput Neurosci 8:19–50. 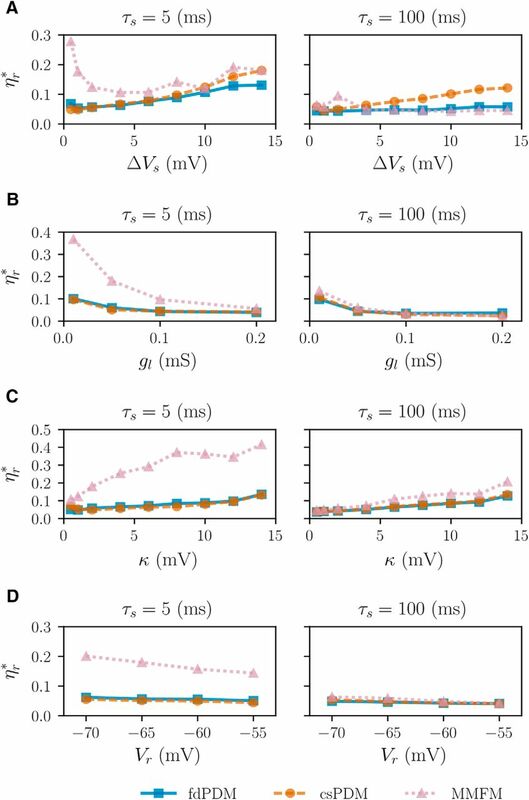 Rangan AV, Kovačič G, Cai D (2008) Kinetic theory for neuronal networks with fast and slow excitatory conductances driven by the same spike train. Phys Rev E 77:41915. Risken H (1996) The Fokker–Planck equation. Berlin: Springer. Tranchina D (2009) Population density methods in large-scale neural network modelling. In: Stochastic methods in neuroscience ( Laing C, Lord GJ , eds), pp 281–316. Oxford, UK: Oxford University Press. Xu Y, Shu CW (2010) Local discontinuous Galerkin methods for high-order time-dependent partial differential equations. Commun Comput Phys 7:1–46.